The residential market in Dubai is heading towards a soft landing with “a gradual recovery” in 2017 following a period of restraint in the wake of oil price volatility and negative investor sentiment, Knight Frank said. With sale prices becoming more realistic and developers adopting a more mature approach to their project launches – phasing projects out and releasing them in line with demand – confidence is expected to return to the market, said the report. “While we have seen a slowdown in demand for residential property in Dubai over the past 18 months, the appetite remains healthy and is expected to rebound over the next couple of years as investors regain their confidence. The real estate market is more mature, and this resilience will drive the next growth cycle,” said Dana Salbak, Associate Partner and head of Research at Knight Frank Middle East. “Dubai’s position as a leading financial hub and competitive tourist destination leaves it exposed and vulnerable to global events. Further volatility in oil prices, elections in the US and across states in the eurozone, and on-going geopolitical tensions are likely to impact the behaviour of markets, currencies and investor sentiment. 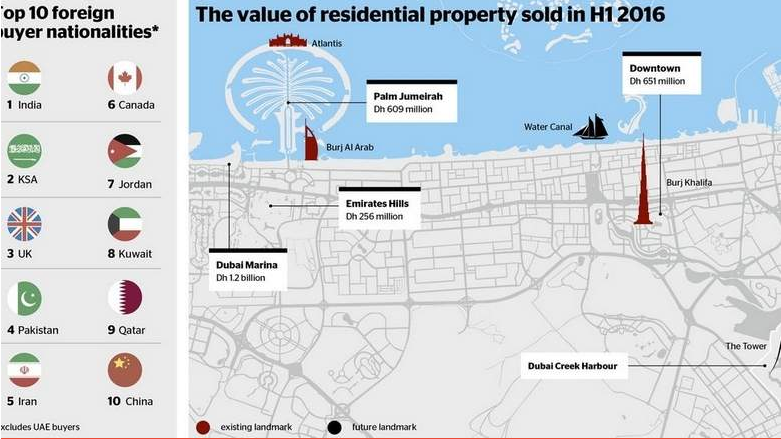 This, in turn, will reflect on the demand for property in Dubai,” said Salbak. “Whether it is the ease of doing business that prompts companies and young entrepreneurs to set up in Dubai, or the availability of international grade education systems and family friendly activities that encourage families to relocate, it comes as no surprise that investors have looked at Dubai with keen interest as it has accommodated for individuals from diverse backgrounds and interests,” said Salbak. The report pointed out that strong regulatory policies undertaken by the government in recent years to avoid market speculation, coupled with solid economic fundamentals and world-class infrastructure have reinforced Dubai’s position as a global hub for trade, transport and tourism, and further shaped Dubai to become a favourable destination for regional and international property investors. “This is in addition to Dubai’s strategic geographical location, providing access to all regional and international markets. In terms of products, Dubai offers an expansive range of property types that cater to its broad platform of investors. We find buyers are drawn to the vibrancy and the central location of Downtown Dubai, given its proximity to the Central Business District and key sources of entertainment such as the newly opened Opera House,” said Salbak. The report said with continued government spending on infrastructure projects, the increased availability of quality investment stock, and the development of more transparent processes and procedures, the real estate industry in Dubai is only set to expand further and attract more sophisticated investors.